The hot conditions in Albury on Sunday could do nothing to quell the energy of Melbourne Heart’s diminutive midfield engine Massimo Murdocca, who put in a vital performance in his side’s 2-1 win. The hot conditions in Albury on Sunday could do nothing to quell the energy of Melbourne Heart-s diminutive midfield engine Massimo Murdocca, who put in a vital performance in his side-s 2-1 win. 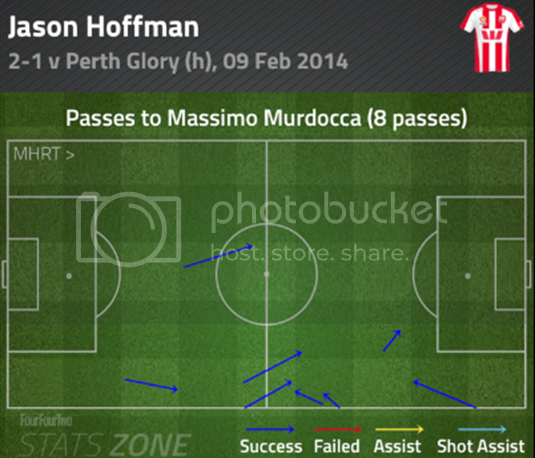 Melbourne Heart's ever-present midfielder enjoyed an effective attacking display at the weekend, taking advantage of Perth's deep line which sat off the Red and White, by buzzing around the edge of the Glory-s box and linking up dangerously with the similarly impressive Jason Hoffman at right back. 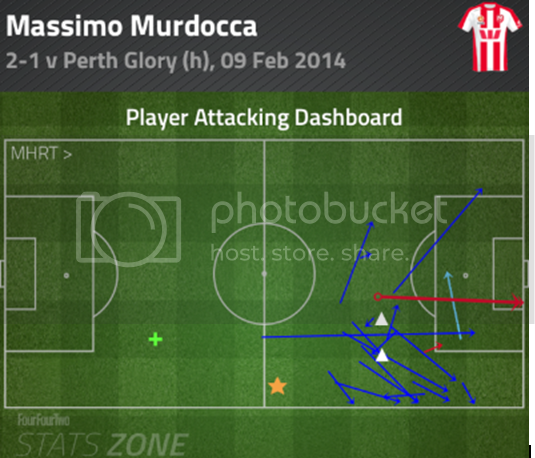 This being the case, Murdocca-s attacking third passing dashboard was quite prolific, as he managed to have 18 out of his 19 passes in this area of the pitch find their target. The image below also shows how they are skewed to the right side of the pitch, demonstrating the support he received from Hoffman. The dashboards showing the pass combinations to each other further illustrate Murdocca and Hoffman-s successful link play. The first image shows how Murdocca gave the ball to Hoffman 14 out of 43 times, while the second shows how he received it from the right back 8 times. 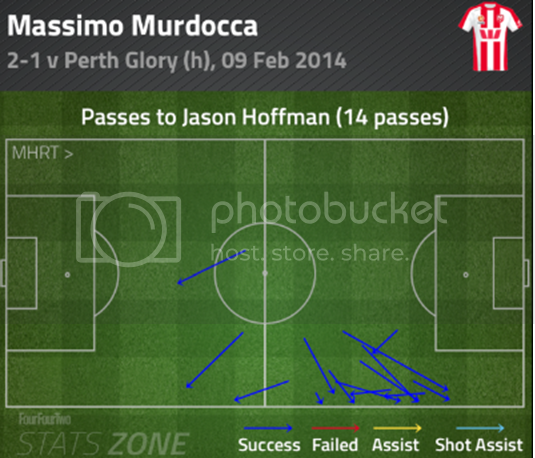 Both of these figures were Murdocca-s highest pass combinations for the game. The attacking sharpness of Murdocca did not distract from his usual defensive duties as he tied with Perth-s combative captain Jacob Burns for the most successful tackles of the game with 3. Murdocca-s accuracy and work high up the field was crucial in helping his side dominate the Glory and continually force them to defend deep within their own half.